What is an employee appraisal? Traditionally staff appraisals take place every six months or annually to review past performance against a set of goals or objectives, assess progress against personal development plans and set future goals or objectives for the forthcoming period. Objective or goal setting helps organisations to align what people do in their role with the company goals and strategy. It enables staff to have a better understanding how their role contributes to the success of the company. To measure performance and reward people according to their individual contribution. Appraisals can help you to understand how well your staff have been performing and reward them based on this. To improve performance: appraisals provide the ideal opportunity to discuss any areas of concern and highlight where improvements can be made. To boost motivation and morale and ultimately employee engagement: appraisals should be a two-way conversation which allow your employees to give their feedback; allowing their voice to be heard. It also demonstrates that the business cares about and listens to them. Are annual reviews appropriate for your business? Your staff want regular feedback. If this is the case, then an annual performance review is not going to meet their expectations and promote engagement. It can also be too late to tackle serious performance, motivation or morale issues if you’re only meeting once per year to review performance. Constant and regular feedback can help staff to review their output throughout the year. It’s also easier for them to make the right changes, speak up if they are struggling, or request a change of direction. Your staff report into more than one manager. Depending on the size of the business, your team members may report into more than one manager who may have a view on their performance and/or their development. Relying on one manager’s perspective during an annual review could lead to issues of bias or areas of performance and development simply not being picked up. Gathering feedback from a range of people such as team members and other managers may provide a more rounded, realistic and objective picture of an employee’s performance and make any personality conflicts less of an issue. Job roles in your business are changing. As your business grows, roles, responsibilities can often change too. Continuous dialogue between staff and managers will allow you to adapt the expectations you have of your team on an on-going basis and they will know what’s expected of them and be able to deliver. 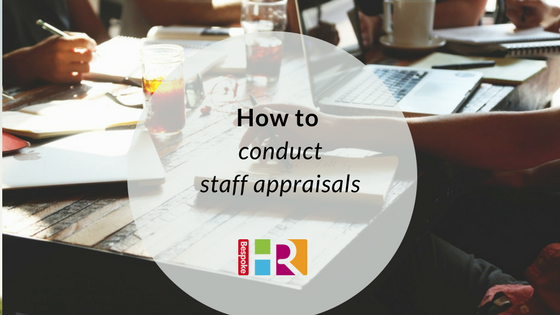 Want more tips on running appraisals? Read our top 10. We have developed a cloud-based Performance Development Review system, try a free demo here.